When you think about motifs for wedding tiaras, probably hearts and flowers and such come to mind long before you arrive at ears of wheat. But when you consider the traditional symbolism of wheat as it relates to fertility, it actually makes a bit more sense that multiple brides from the Dutch royal family have worn the family’s Ears of Wheat Tiara on their wedding days. This tiara began its life far from the Netherlands, and not as a tiara. The “ears” were originally a set of eight diamond and silver brooches owned by Grand Duchess Catherine Pavlovna of Russia. They were apparently made around the turn of the nineteenth century; as Catherine was still living with her Romanov family at that point, it’s possible that they’re a Russian creation. Catherine married twice — first to Duke Georg of Oldenburg and then, after being widowed, to King William I of Württemberg — and the brooches traveled with her to each of her new homes. Catherine’s only daughter, Sophie, inherited the brooches; she became queen of the Netherlands as a result of her marriage to her first cousin, the future King Willem III, in 1839. When Sophie died in 1877, the brooches passed to her only living child: her youngest son, Prince Alexander. He was expected to become king, but his unexpected death at the age of 32 meant that his younger half-sister, the four-year-old Princess Wilhelmina, became the heir to the throne and the new owner of the wheat brooches. Wilhelmina wore the diamond ornaments attached to a headdress, but the brooches were not mounted on a tiara frame until the 1950s. 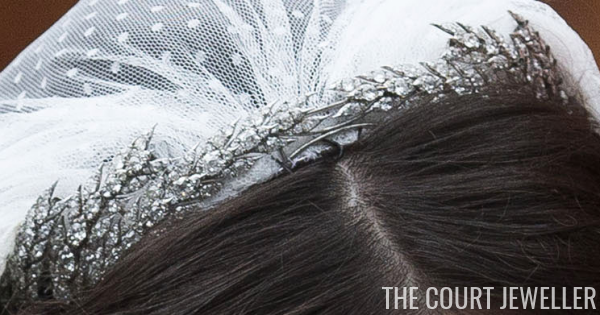 The tiara can hold either four, six, or all eight of the brooches. Princess Irene was the first to wear the tiara, but it quickly became a favored piece of Princess Margriet (pictured above). It’s only fitting, then, that all four of her daughters-in-law wore the tiara for their weddings: Princess Marilène in 1998, Princess Annette in 2000, and Princesses Anita and Aimée in 2005. One of Princess Irene’s daughters, Princess Margarita of Bourbon-Parma, also wore the tiara for her first wedding in 2001, but the symbolic magic of the tiara didn’t work for that union. She and her first husband divorced, and she chose to wear flowers in her hair rather than a tiara for her second wedding — which has worked out much better than the first. 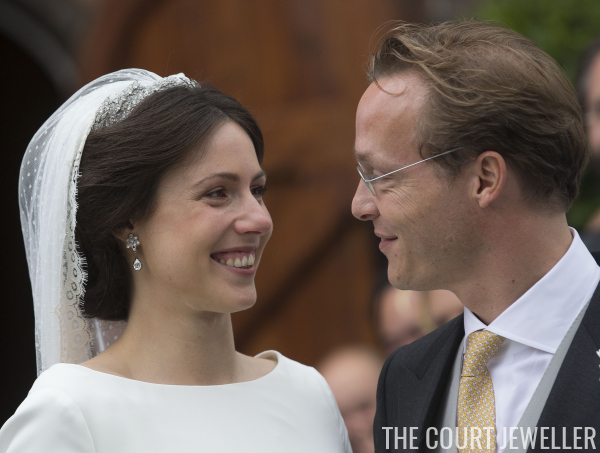 Princess Irene's daughter-in-law, Viktoria, donned the tiara for her wedding to Prince Jaime of Bourbon-Parma in 2013, and that marriage is also still going strong. Princess Beatrix's branch of the royal family has also taken the ears of wheat out for a spin. Princess Laurentien wore the tiara at the Norwegian royal wedding in 2001. Queen Maxima has also worn the ears of wheat, but not as a tiara. She's worn several pieces from the set as hair slides; on one occasion, she also affixed some of the ears to her hat.